Finish the seams and edges of your garments and home dec projects more easily than ever before and get that professionally done look with the Necchi S34 Serger. The selection dials on the side of the machine help you to find the exact setting you need. Choose differential feed settings of 0.5 – 2.25 and cutting widths of 3.1 – 7.3 mm. Sewing speeds of up to 1,300 stitches per minute will ensure your projects get done quickly and efficiently. Color coded threading helps to get the machine threaded correctly. The threading chart is right on the machine. 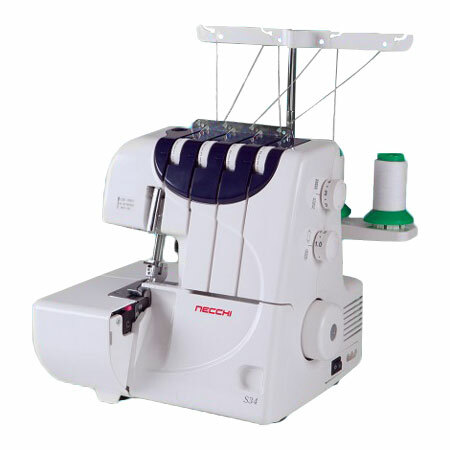 The S34 is a 3 and 4 thread convertible serger. It features adjustable foot pressure, a thread tension release mechanism, snap on feet and a quick rolled hem changeover. The retractable upper knife is great for those time when you only need to finish off a seam without cutting the fabric. Get beautiful professional results every time!